Nick Smith, Shoulder Specialist Physio: Having assessed and treated two significant shoulder injuries this month that both required surgery - one from snow boarding and the other skiing - I thought I would explain some of the the common snow boarding and skiing related injuries and how they can affect you. Soft tissue injuries occur when falling awkwardly. The rotator cuff muscles are most commonly injured, resulting in pain, loss of shoulder movement and power. Low grade injuries can be treated successfully with physiotherapy. More significant injuries may require a shoulder specialist referral and imaging, and then physiotherapy. Other structures often injured include the shoulder cartilage, bursa, tendons and chest muscles. Be aware of significant bruising to upper arm and chest muscles and changes in muscle contours. Shoulder joint dislocation generally occurs when falling and your arm is away from your body. Acromioclavicular (joint on the top of your shoulder) separation occurs with direct impact to the top of your shoulder. Pain, joint deformity, loss of shoulder movement and swelling usually result. Depending on your age and grade of injury, research indicates physiotherapy is your best choice of treatment. Bone fractures to upper arm, shoulder joint, clavicle (collar bone) and shoulder blade occur with impact injuries either with your arm away from your body, onto your elbow, or direct trauma to the shoulder joint. Be aware of pain, joint deformity, loss of movement. 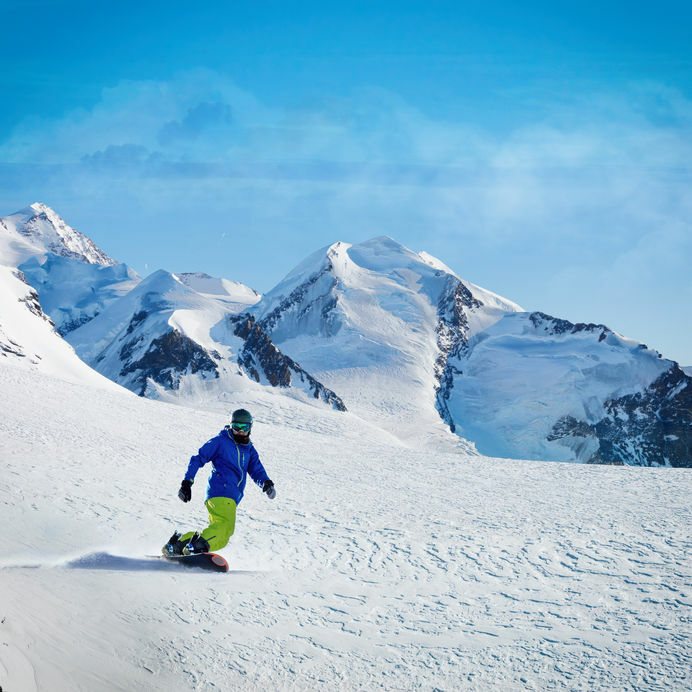 Snow boarders have a significant increased risk of injury to the wrist, hand or thumb. These injuries occur due to falling on an outstretched hand (FOOSH) and trying to break your fall. Wrist guards can be worn to help protect and limit the damage. If you sustain any of the above injuries get them checked out, most low grade injuries respond with physiotherapy! Do not over estimate your own ability/fitness - Altitude can cause fatigue, shortness of breath, headache and nausea within the first 48 hours. Drink more water, avoid salty foods, eat high carb foods e.g. pasta, fruit, vegetables. Consider the terrain and snow conditions - If you are in a white out or flat light, slow down and use your poles by keeping them in contact with the ground, stay relaxed, look out for markers on the piste, use the correct goggles and keep them clean. When conditions remain excellent, remember that the risk of avalanche remains high in most places this season. Check your equipment - every day before you ski or snowboard and have any faulty equipment repaired or replaced before you hit the slopes. Avoid excessive alcohol - it's obvious, but before you order that last vin chaud, consider whether it could be your undoing on your ski back from the bar to your chalet. If you'd like an appointment to see one of our physios, please give us a call on 02030 12 12 22.